Raised bed gardening may seem like it's only for small-scale home gardeners, but the small farmer and homesteader will find that raised bed gardening has benefits for larger-scale production as well. If you have poor, rocky soil or live in an area that has a high water table or overzealous rainfall, raised beds can solve your drainage and soil fertility issues. Some raised beds use the natural soil on the ground, while others are built empty and filled with a mix. Raised beds allow the soil to warm more quickly in spring. The soil is never walked on, so it doesn't get compacted. Weeds can be less of a problem in raised beds, especially if you start with a weed-free soil mix. You can grow just about any plant in a raised bed: fruits like strawberries, blueberries, and raspberries; vegetables, herbs, and flowers. The simplest raised beds are mounds of soil piled several inches higher than the surrounding terrain. They don't even need sides! 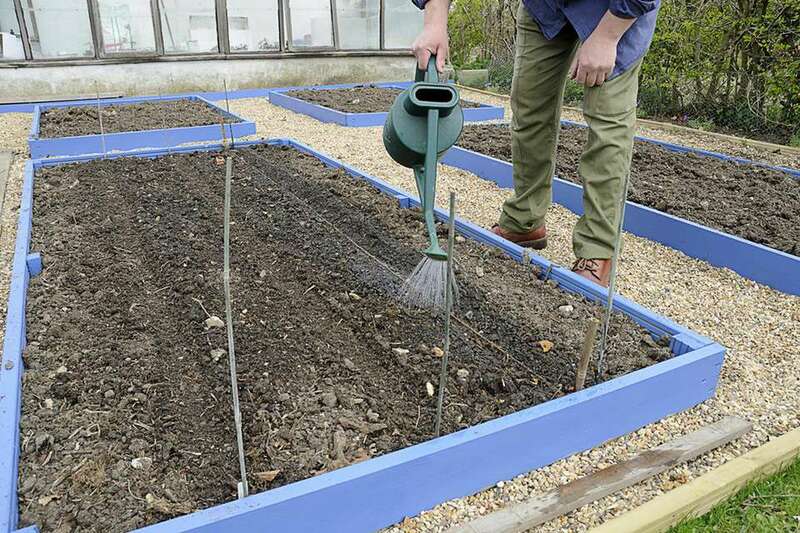 Many small farmers use this type of raised bed or raised row gardening to help soil drain more quickly and to add additional amendments to the top inches of soil for shallow crops and to help seedlings get established better. But many gardeners opt for beds that are built with sides. These sides can be made of wood, stone or cement. It's really a matter of what is least costly for you and what you have available. Cedar is a great wood for raised beds because it is rot-resistant. Hemlock is a less costly alternative that also works well (my beds are made of hemlock). Juniper and redwood are other common wood choices. Do not use pressure-treated wood for your beds, as it may leach toxic chemicals into the soil. Other options include concrete blocks, natural stone, or brick. You can also use boards made of recycled plastic like those that are used for decks and other outdoor structures. You can also use bales of hay or straw as sides for your raised beds. The straw will decompose after a season, but you can move it to the compost pile and use new bales the next year. You may be wondering what size to make your raised beds. The determining factor is that you need to be able to access the beds from all sides. Three to four feet wide is ideal. Technically, raised beds can be as long as you want them to be. But limiting raised beds to 8 to 24 feet long makes it easy to practice crop rotation because each crop can be rotated to a completely new bed. This can inhibit insect pests that may spread diseases through the soil in one long bed. Raised beds should be at least 6 inches deep and up to 36 inches deep. If you have good soil beneath the beds, roots will reach into that soil and continue to grow. The number of raised beds is limited only by your budget and is determined by your desired yield. If you are a homesteader seeking food self-sufficiency, a rough guide is 700 square feet of growing space per person. A market gardener would use even more. If you create beds 4 feet wide by 25 feet long, that would mean 7 raised beds per person in the family. For raised beds that are 4 feet wide by 8 feet long (a very standard size) that would be 22 beds per person. That's just a very rough guideline. So you can see that if you are going to want to use raised beds to grow food in quantity, you will need to create quite a few of them! Don't feel daunted. You can add a few raised beds every season and continue to grow crops in the ground in the meantime. But if raised beds are your only option for growing, just make the investment of time, labor, and money, and enjoy the rewards for many seasons. The key is to build beds for the next season in the summer or fall, not in the spring. Sow a cover crop for over the winter. Come spring, you can cut the cover crops and add them to the compost, cultivate the existing soil in the beds, and plant.